Gala Bingo is a large bingo and casino operator here in the UK. "For over twenty years, Gala Bingo has been the UK's most loved and trusted Bingo operator, a solid household name in the gaming industry, with over 143 clubs, 5 million members, and paying out prizes across retail and online of over £42million per week." I've worked on a number of projects for Gala Bingo working together with a fab design company from Leicester called Work Design. Below are some of the projects I have helped create. We produced a fun promotional calendar to hang on peoples walls and help promote Gala Bingo for the whole year. I was asked to create the 12 illustrations used on the calendar, and they are all based on the most popular bingo calls. Any bingo officionados out there will know the common and quirky calls used in bingo halls all over the world, but if you need reminding of the full list you can check out this extensive Wikipedia page. Kelly's eye 1, Knock on the door 4, Lucky7, Doctors orders 9, David's den 10, Legs 11, Unlucky for some 13, Key to the door 21, Two little ducks 22, Droopy drawers 44, Clickety click 66, Two fat ladies 88. A fun character design based on a bingo dabber. The initial idea was for either a female or male character as you can see from the sketches. The final character chosen was a quirky male that could work in several poses (happy, sad etc). We worked on a few colour variations before settling on the Gala blue. 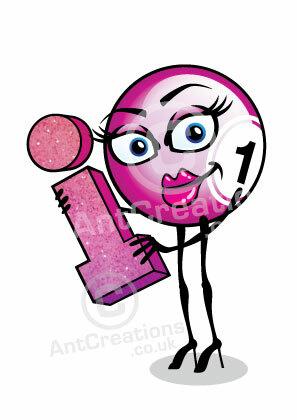 A set of fun but simple 'Winna Ball' characters to appear animated on big screens in the bingo halls and online. Both female and male characters were needed, showing a range of emotions and also a choice with 'specs' to suggest an older character. We tried a few colour variations but eventually settled on the Gala gold. 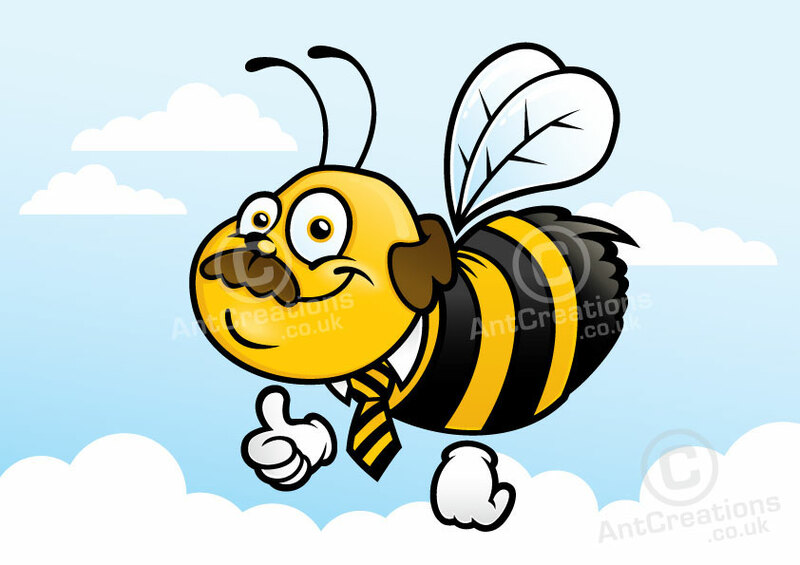 A full family of bumble bee characters to promote a game named 'Beeno'. The characters appear animated on big screens in the bingo halls and online. Mum, dad, granny, and three younger family characters were needed. The arms/hands and props are all interchangeable to allow each character to have multiple poses using the same artwork. I sketched many different bee character initially, before we settled on the final bee family style. This was an internal Gala Bingo project. One of the Gala team needed to be illustrated in a 'Del Boy' from 'Only Fools and Horses' theme, complete with the wardrobe of the much loved comedy character. I illustrated a standard pose and also a couple of variations with a truck full of 'goodies'.